The most famous American species, Hamamelis virginiana has become invaluable as stock on which to graft more ornamental cultivars. Among others, this list includes Agastache scrophulariaefolia, Aristolochia serpentaria, Carya laciniosa, Hamamelis virginiana, Hybanthus concolor, Ilex verticillata, Lobelia cardinalis, Huperzia lucidula, Lycopus virginicus, Triosteum aurantiacum, Triphora trianthophora, and Ulmus thomasii. 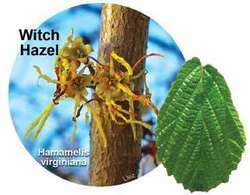 The herbal remedy, Hamamelis virginiana (witchhazel) can be invaluable for cases where bleeding is a feature.